Housing—how to build it in a way that’s affordable, humanistic, and supportive of community—was a central question of architectural debate throughout the 20th century. Add to that list a more recent concern with sustainability in the face of climate change, and you have a complex puzzle requiring both sensitivity and practicality, a combination that, as many high-rises and housing developments reveal, has often gone missing. Few places today demonstrate exactly how important all of these elements are to thriving communities more than Puerto Rico, where 3.3 million citizens face extreme hardship due to hurricanes Irma and Maria in the fall of 2017 and the island’s pre-existing debt crisis, which, among other factors, has hamstrung recovery efforts. Although the official death toll is 64, the New England Journal of Medicine reported that there were 4,600 more deaths from October to December 2017 than there were in the same period the year before. As of the end of May 2018, many people still had no running water and almost 14,000 had no power, the hardest hit being those outside urban areas. It is the longest-running major power outage in United States history. With that in mind, Lorena del Rio, Mersiha Veledar, and Kevin Bone, professors in The Irwin S. Chanin School of Architecture, challenged this past year’s third-year students to research, contemplate, and respond to the crisis by designing housing that included strategies to mitigate the impact of storms past and future. 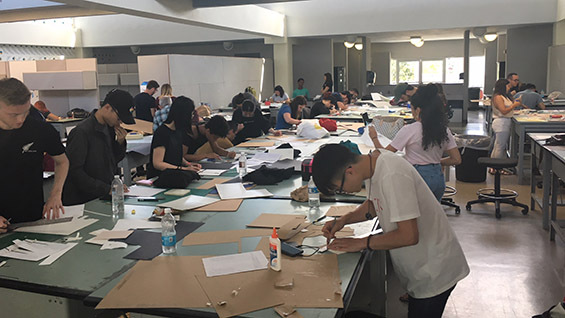 The studio was organized in collaboration with the University of Puerto Rico (UPR), so students traveled to the island, where they saw firsthand some of the challenges to designing in a world of rising temperatures and debt. 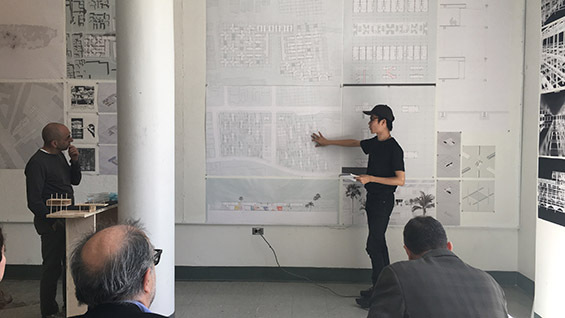 The studio was designed as a quick progression to give students a breadth of knowledge about the history of Puerto Rico, both natural and political. The first week, students produced context analyses in which each investigated an aspect of the island—its resources, topography, and culture— and then developed ideas about incorporating productive activities back into the urban fabric: anything from making music and art to cultivating local medicinal plants to creating locally owned business. The thinking was that since so much of Puerto Rico’s culture had been subsumed by American industrial organization, locals have lost traditional forms of production and the means to provide for themselves. The coffee industry provides a prime example: coffee crops were once grown primarily for export; Puerto Ricans had to drink coffee grown elsewhere that was imported to the island. Similarly illogical arrangements inform multiple industries. For that first project, students illustrated their findings on a host of topics, including migration patterns, agriculture, and land division in Puerto Rico. Dylan researched the island’s pharmaceutical industry, which once received massive tax breaks for relocating there allegedly to create highly skilled jobs for Puerto Ricans. Dylan learned that the expected return has not been realized, and set out to create a housing scheme that builds on knowledge of traditional herbal medicine. His classmate Zhenia Dementyeva investigated a vernacular form of gardening and farming particular to Puerto Rico called canuco, a technique in which discarded fabric is buried to act as an anchor for plants grown on sloped land. It’s a method particularly useful for preventing erosion and catching rain- water. “This ingenious plan inspired the roofscape of my project,” she says, referring to her final proposal in which she carefully calculated the amount and direction of sunlight to design where each apartment’s garden would be situated. Students also researched well-known houses and buildings largely from the 20th century, a survey that included Alison and Peter Smithson’s Robin Hood Garden Apartments (1972), Luigi Moretti’s Casa II Girasole (1950), and Kazuyo Sejima and Ryue Nishizawa’s Gifu Kitagata (2009). Then they embarked on a study of the specific site in San Juan and of building systems that would work best for the climate. The site, in the east San Juan neighborhood of Turce, is divided into seven segments and includes three public schools, a park, and, on the north side, a public beach (which is rare—most in the area are open only to hotel guests). The highway Calle Marginal defines the southern boundary of the site. To the southeast is Residencial Luis Llorens Torres, the largest public housing development in Puerto Rico, with a long and troubled history of violence and drug dealing. Because of its proximity to the sea, the site is regularly flooded. After Hurricane Maria, the waters took four weeks to recede from the park. 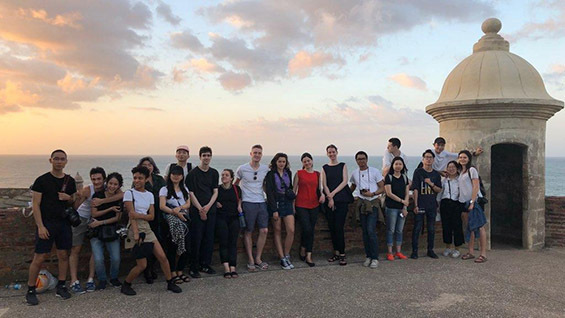 During Cooper’s spring break last March, del Rio and Veledar traveled with their students for five days in Puerto Rico, moving at a breakneck pace around the island, to see as much as possible of the landscape, housing, and culture there while collaborating with their colleagues. “They of course brought a great deal of knowledge to the table about the politics of the island as well as the housing needs of Puerto Ricans,” says del Rio of the 48 UPR students. 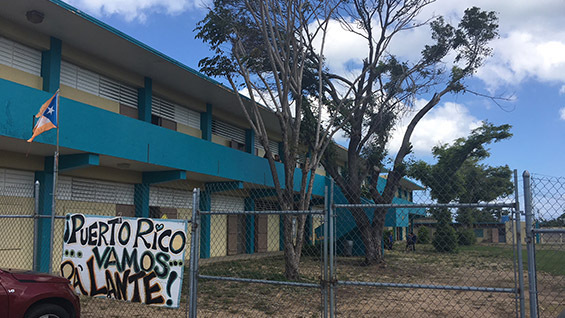 As they traveled from San Juan to the center of the island, down to Ponce and then back to the capital, the Cooper students discovered that despite the great damage done, scores of people have found creative ways to survive, and even more, to alter power structures, physical and political. The best example of this is Casa Pueblo, a community in the center of the island that has played a critical role in the post-Maria recovery. A coffee plantation that produces its own energy using solar panels, the collective became a haven for people who had lost power after the storm, providing them with solar- powered lights and refrigerators. Additionally, in an effort to question and even counter Puerto Rico’s dependence on American industrial demands, some young people have taken up small-scale farming. José Javier Toro, a professor from UPR’s School of Architecture, helped design the course with colleagues there and at Cooper. He noticed that the two sets of students tended to create divergent solutions to the design problem at hand, though he cautioned that the work should not be compared since the two groups’ approaches were rooted in very different experiences. “Naturally, the local students had lived through the difficulties during and after the storms. This greatly affected their perspective, their studies, their capability to complete work, and perhaps made them work with a greater sense of urgency and maturity,” he says. Nonetheless, he thought the camaraderie among the student groups was exemplary, and had an enthusiasm beyond that found in most studio courses. Cheung Lun Jeremy Son, a third-year student from Hong Kong, developed the southwest corner of the site. Inspired by Luigi Moretti’s Corso Italia, Le Corbusier’s Unité d’habitation, and the mobile architecture of Yona Friedman, he proposed a steel structural frame that could be arranged in multiple ways to suit changing housing, commercial, and educational needs. “The scheme is to create a structural urban framework that anticipates housing units, commercial activities, and educational institutes as an evolving mechanism that could expand or contract as necessary over time,” Jeremy explains. “It is designed to be carried out periodically in phases. Residents shape their housing to their needs and thus shape their neighborhood.” In addition, he sees the frame as a way for the site to remain open to the rest of the city, countering the trend toward gated neighborhoods that promote exclusivity. All public, commercial, and cultural activities were placed on the ground floor of the housing development, but living spaces were elevated for greater privacy.